Greetings. I have a John Deere 420 loader that has a siezed pivot joint below the upper loader arm near the cab. The large pin (about 1" diameter) appears to be seized onto the round part that is welded to the hydraulic cylinder and rotates as the loader is raised/lowered. This snaps the small 1/4" diameter pin that is designed to prevent the 1" pin from rotating. When I bought the tractor (used) that joint was missing the grease fitting and it won't take grease despite cleaning and installation of the new fitting. I removed the grease fitting, cleaned the hole and the entire area. It's been soaking with WD40 sprayed all in the hold and around the joint for 4 days and still hasn't freed up. I even tried to tap the 1" pin out (gently) with a sledge hammer, push on the end with an air hammer and it just won't budge. The loader will still work but will wear the pivot point collar since the 1" pin is designed to be stationary. Any other ideas on how to free up the pivot joint? Or do I just need to heat it and beat the heck out of the 1" pin? well if I followed all points my guess is the pin has seized to the bushings or both are scarred either they are locked together physically. If so you possibly will need to replace the bushings. If you heat the pin it expands making removing it worse unless you are heating it and then allowing it to fully cool it is possible that might break it loose but normally you would heat the bushing as it explaining should loosen the pin. Doubt WE 40 will prove to be much help for think you are past rust being the issue. If you have a pulley puller that would fit it might could push the pin loose but it probably would take a large one. Think you will find heating it to give it some movement and the use of a good size hammer to be what it takes. Be sure you have the weight off of the pin and you may wish to have someone slowly operating the loader to see if there is a position where it moves. You might need to hammer on the end not drilled for the pin as that end may swell easy. One other thought with potential damage to the bushing, get a grade 8 bolt for the retaining pin and it might be strong enough it does not shear. There is still one other thought but think the pin is too long to consider, drill the pin out being very careful to be centered and straight. Do not drill through the pin side walls but close enough you could take a hammer and punch or chisel and collapse the walls of the pin in. Working on about same job myself except the pin snapped leaving damaged bushings. Picture an arbor press on its side. Recreate the principle using whatever is handy keeping in mind you'll need room for the hydraulic jack. Be careful beating on it as that could displace enough material to expand the pin in the hole. The technical term is staking. You might want to talk to a heavy truck mechanic (Kenny that doesn't mean what you think--the truck is heavy, not the mechanic) and see if they have a ball joint/tie rod press. Looks like a big C clamp. I'd try some Blaster or othe penetrant. Then try a hardened 1/4 inch bolt. Otherwise I would have to concern about take loader off tip on its side and WHAIL the snot out of the pin to remove it. then put in new bushing and pin. If there's a Parts Source store near you (as I have in Waterloo) they'll loan a front-end kit containng a wide array of pullers. You leave a credit card slip for its value (around $250) and get it back if you return it the next day or so. First off, put in a new grease niple and insert it. Then get a 'grease blaster' (likely available at Princess Auto or any good auto supply place. It's sort of a hydraulic cylinder with a grease fitting in the end of the piston rod. You put it on a grease fitting and give it a few good hits with a dead blow hammer and it injects grease at very high pressure. If that still doesn't work, get a 'plumbers soldering blanket' at Home Desperate or any building supply place. It's a small fire-proof cloth that is widely used in the plumbing industry when soldering pipes near wood framing. Put this in a circle around the seized pin and with a small propane torch heat the end of the pin as much as you can without heating the FEL frame. Then while it's hot try giving it more grease. If none of that works, get a powerful drill and make a good-sized dimple in the end of the pin, then with a stout punch and hammer, give it some persuasion. Thanks for all your suggestions and fast replies! I haven't tried a graded bolt yet but it did snap a brand new JD retaining pin like it was a match stick. 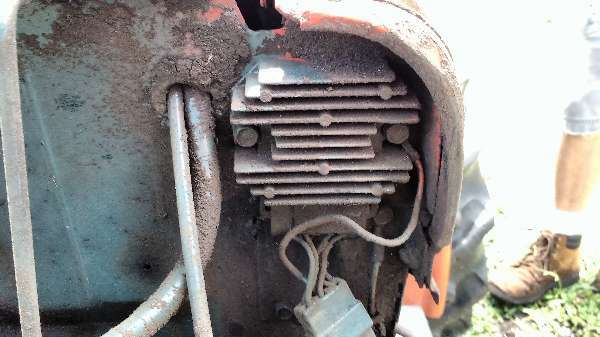 Maybe a combination of heat to the bushing and a graded bolt while moving the loader might work. I'm reluctant to put too much heat on the bushing because I'm afraid it might weaken it. Would a regular propane torch be appropriate or should I use the heating attachment for my oxy/acetylene torch? I'll check out the Parts Source but I think most automotive pullers would either break or bend the loader frame. It's no problem destroying my tools but knowing murphy, I don't want to break one part of a $250+ puller set. The arbor press idea is a good one. I was thinking of making a press/puller using a small hydraulic jack an some chains. The trick is a backer plate on the back side with the right size hole drilled in it for the pivot pin to pass through. If the backer plate isn't contacting the collar/bushing it could bend the loader frame. Maybe it's best to take the loader off, tip it on it's side and use an arbor press or try a hydraulic press. However, the hydraulic quick disconnect collars are seized as well but that's a whole other can of worms. If all else fails, drilling it might be the only answer. I'll post a follow up with the solution. Operating the loader could help, but I'd jack up the arm just enough to neutralize its weight. Then I'd try to combine the steady and accurate positioning of a press with the added persuasion of sledge blows. Murph: glad to know about that grease blaster -- just what I need. First off, a propane torch is all the heat you will need. Secondly, as backwards as it sounds, you want to heat the pin not the bushing. The reason is, you want to drive the grease into the seized area. Enlarging the bushing will create less pressure not more. By filling the cavity with grease, and heating the pin, it does two things, first it thins the grease, but more importantly, when the pin swells it leaves less room for that thin grease, it's only solution is to go where there's no grease, the seized area. Finally, I wouldn't try moving it as a solution. The seized spot is likely from corrosion, turning it will only chew up the bushing more. As it turned out the problem is more severe than the grease blaster can fix. I even removed the ball bearing from a grease fitting and spare coupler, cleaned the fitting out and tried to put 150 psi of air into the joint to force air and penetrating oil into the bushing but no luck. I did try heating the bushing (with the grease fitting removed) and tried several times to move the pin but no luck. I'll try with a new grease fitting installed and as much grease that I can fit in it before heating the pivot pin this time.